BUYING BEADED ROLL ON BRACELETS FROM THIRD PARTY DEALERS IN NEPAL: DO YOU KNOW WHO YOUR MAKERS ARE? Let’s get real here. The vast majority of companies that sell beaded roll on bracelets in Nepal to customers in the US are resellers. There is nothing inherently wrong with reselling as a business practice- just think of all the levels of a supply chain here in the US! 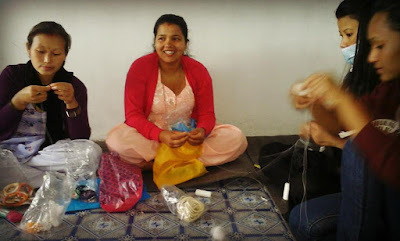 However, in Nepal, this model puts already disadvantaged women even further down the chain. They do not have the same protections afforded them as workers do in the US! Lotus Sky Grab Bag Bracelets in mouthwatering greens and blues! When you introduce a third party, or even multiple parties, into the chain between the producer and the consumer, you push the makers to the bottom of the barrel AND wage level. You also disconnect the makers from their fans and followers around the world, giving them no voice or ability to continue the conversation with those who love their craft! Lotus Sky girl, Kalpana, crocheting up a new design she just learned at the Lotus Sky studio in Boudhanath! There are several enormous dealers of these bracelets in Nepal. They are all men, despite the fact that these bracelets are all handmade by women. They recruit village women, at rock bottom prices, to fill orders. They do this because buyers in the US, especially wholesale customers, demand cheap prices. Because the price paid to the women is so very low, the dealers can markup their prices 5-10 times and still deliver a “cheap” price to their customer in the US. The only people who are hurt in this commerce chain are the women who make the bracelets. The cheaper the customers want their bracelets, the more the dealers cut their wages. Right after the April 25 Earthquake in Nepal, all of the girls rallied together to continue their work and support one another! At Lotus Sky, we are so very proud that all of our Nepal roll on bracelets are made by Lotus Sky women, in adherence to the principles of fair trade and ethical consumerism. And, as our customers, you too should be so very proud of your buying choices and to be a Lotus Skyer! Because we handmake all of our roll on bracelets, we can offer you, our customer, the unique opportunity to custom design even one bracelet from scratch in the size, pattern, and color of your choice! 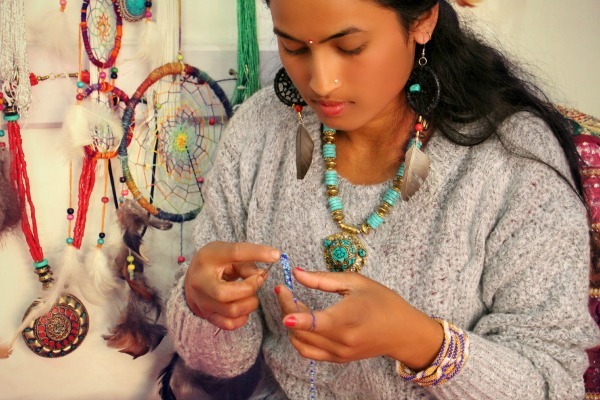 Over the next month, we will be featuring various Lotus Sky women- the makers behind your beautiful Nepal roll on bracelets- right here on the blog. These are the women that are so often hidden behind the product and the commerce, but they are the heart and soul of Lotus Sky and we want you to know each and every one of them! We also want to offer you the chance to custom design your very own bracelet with us! Now is the perfect chance to design that bracelet that is uniquely yours and fits your personality, just in time for Summer! We can’t thank all of you enough for being Lotus Skyers and can’t wait to see what you will design! !